An aneurysm is a permanent 'dilatation' or 'ballooning' of an artery to at least 150% of its normal size. 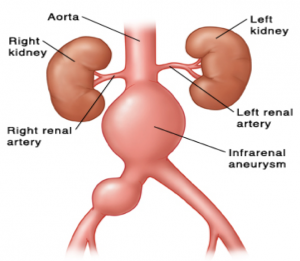 Aneurysms can affect the aorta, the major artery of the body running through the chest and abdomen. An abdominal aortic aneurysm (AAA) is the most common type. Abdominal aortic aneurysms (AAAs) can occur in males or females, but are most common in males. The prevalence of AAAs in males over the age of 65 is in the range of 5 - 10%. Other major risk factors include advancing age, smoking, and family history. Around 10% of patients with an AAA will have a popliteal artery aneurysm (behind the knee) on one or both sides (see Popliteal Artery Aneurysms). Evidence from the United Kingdom suggests that males should have a screening ultrasound for an AAA at the age of 65. Males or females who have a first-degree relative ever diagnosed with an AAA, or other aneurysm, should have a screening ultrasound at the age of 50. Patients who have been diagnosed with a popliteal artery aneurysm or a thoracic aortic aneurysm (in the chest) should be investigated for a TAA or TAAA, and vice versa. AAAs may be diagnosed incidentally on screening ultrasounds, during abdominal imaging for other indications, or during clinical examination. Patients sometimes experience back pain and/or abdominal pain associated with an AAA. Rupture is the major risk associated with an AAA. Rupture causes acute loss of blood in to the abdominal cavity and is a life-threatening emergency. Even with emergency surgery, it is associated with a high rate of mortality. It is common for old thrombus (clot) to line the walls of an AAA. Rarely, pieces of this clot (and sometimes new clot) can break free from the aneurysm and travel to the leg arteries, blocking the flow of blood. AAAs should be treated when they reach a size of 5.5cm diameter. Aneurysms can be treated at a size less than this if they cause symptoms or are growing rapidly. Mr Milne is a specialist in both open surgery and minimally-invasive endovascular repair for the treatment of AAAs. He has a special interest in the minimally-invasive treatment for complex aneurysmal disease. The choice between open or endovascular repair is specific to each patient and their circumstances. It depends on the anatomy of the aneurysm, patient age, and existing medical conditions. The choice of treatment is discussed in detail with Mr Milne during the pre-operative consultation. Visit the Treatment Options for Aortic Aneurysms page.